This cable pattern is fast and fun to knit. It would be a great accent to many projects such as hat, purse, placemats and many more. I like to use small cable panel like this one in front of a hat to add a more interesting look. I tend to get bored easily with just plain knit and purl. Oxo Ripple is very similar to Medallion Cable except it has seed stitches in the middle and Medallion doesn't. 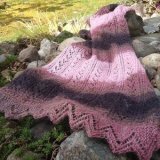 I hope you enjoy knitting and incorporate it to your project. 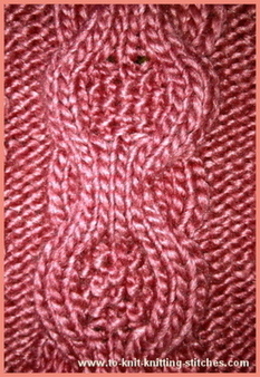 Here is the Oxo Ripple Cable Panel Stitch Pattern. Row 2: P2, [k1, p1] twice, k1, p2. Row 3: K3, p1, k1, p1 k3. Row 4: As same as row 2. Row 5: As same as row 3. Row 6: As same as row 2. Row 7: C4F, k1, C4B. Repeat these 12 rows to form a long Oxo Ripple Cable Panel. C4B (Cable 4 Back) = Slip the next two stitches on left needle onto a cable needle and hold them at the back of work. Knit two stitches off the left needle and then return to knit the two sts. from the cable needle. C4F (Cable 4 Front) = As same as C4B except leaving the cable needle in front of work instead of back of work.